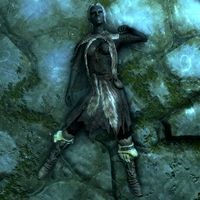 Sild's Assistant, a Dunmer bandit wizard, lies dead near Sild the Warlock in the depths of Rannveig's Fast. She wears fur armor while her footwear is randomly determined. There is always a 50% chance of a pair of fur shoes and a 50% chance of leveled footwear; from level 1-5 it can be hide boots, from level 6-18 it can be leather boots, and from level 19 it can be scaled boots. If you fall into Sild's trap, he will briefly mention her, although he will mistakenly refer to her as being male: "Oh, and don't mind my assistant here. He may have seen better days, but he's still more help to me dead than he was alive." Despite Sild referring to his assistant as male, the body you find is that of a female. This issue has been addressed by version 1.3.3 of the Unofficial Skyrim Patch; The corpse now appears as male to fit the dialogue.